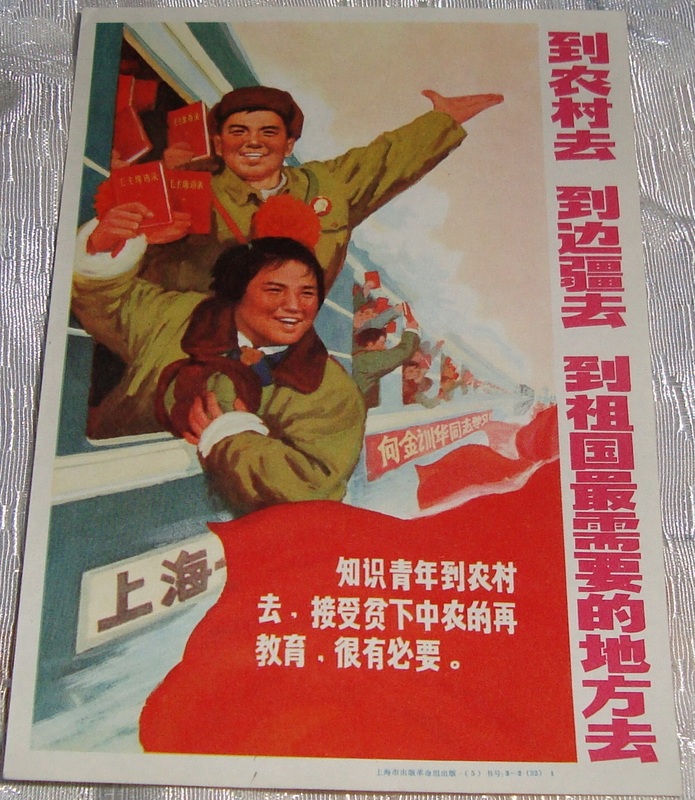 Pictured above: a revolutionary poster included in Book #3 of The China Trilogy, China Is Communist Dammit. 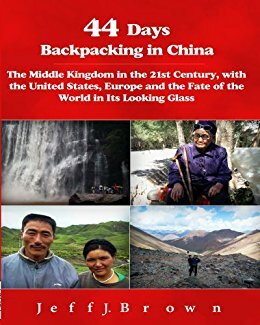 Shown are Shanghai educated youth going to Xinjiang, with Mao Zedong’s Little Red Book in hand, to teach the peasants what they knew, but more importantly, to come back home, changed themselves, forever. If you find China Rising Radio Sinoland‘s work useful and appreciate its quality, please consider making a donation. Money is spent to pay for Internet costs, maintenance, the upgrade of our computer network, and development of the site. Paypal to jeff@brownlanglois.com. Thank you. In The China Trilogy, I wrote extensively about China’s 1966-1976 Cultural Revolution. I regret what I said in Book #1, 44 Days, as I still needed thousands of hours of reading, research and writing, to admit my incorrect interpretation of this world changing event, not to mention the Great Leap Forward (1958-1962) and the Mao Era in general (1949-1978). Book #2, China Rising and #3, China Is Communist Dammit, finally got the true story right. When I was a volunteer in the Peace Corps, 1980-1982, living and working in the foothills of the Atlas Mountains, in rural Tunisia, it changed me forever and my outlook on life for the better. Making just enough for my needs, living a humble existence and working with tradition bound farmers was an eye opening, soul searching experience. I don’t think my trajectory is much different from many people who make the same plunge and really push themselves outside their socioeconomic comfort zone. The same can be said for the 17 million educated urban youth, who were sent to the countryside, 1962-1979, 14 million of those during the ten-year Cultural Revolution. Its official name was, Up to the Mountains and Down to the Countryside Movement. They are commonly called, sent down youth. Untold numbers of sent down youth returned home and continued to live a life of service to the masses. 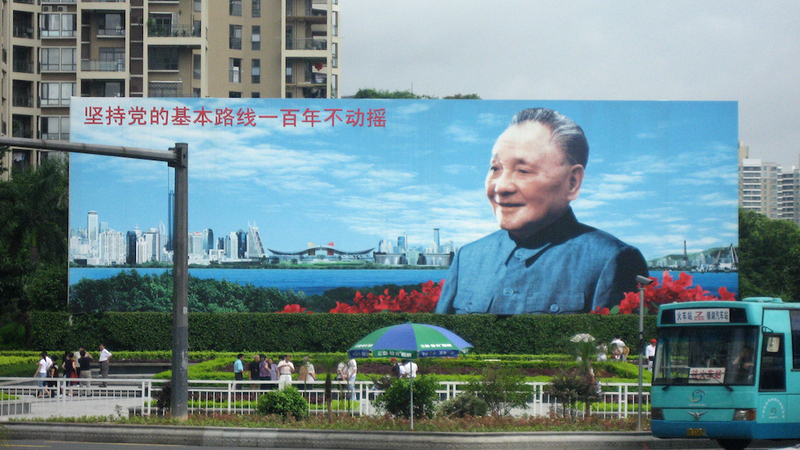 Many are famous, including President Xi Jinping, Premier Li Keqiang, China’s previous President Hu Jintao and others. 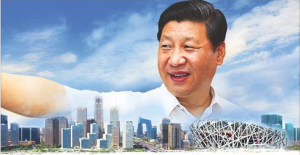 (https://www.straitstimes.com/asia/east-asia/president-xi-jinping-and-other-sent-down-youths-who-are-now-big-names-in-china). After toiling for seven years in isolated, rural poverty, covered with fleas and lice, XJP famously said, to paraphrase, I left the city a skinny boy and came back a strong man. I’ll say. 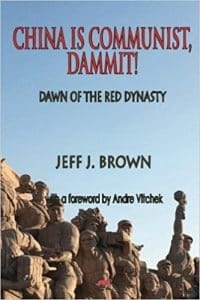 Westerners and many Chinese have been brainwashed that the Cultural Revolution was an unmitigated disaster that almost destroyed the country. That’s simply not true. It was harsh, sometimes violent and unfair for the 10% of the urban citizens who were bourgeois elites. But, for the 90% of people who were workers, peasants, soldiers and students, this decade of transformation was largely very positive and beneficial. The problem in the West, it is those 10% elites who write their scar literature, get the million-dollar book deals, then are feted and awarded in the West’s, racist, anti-communist, anti-China, Big Lie Propaganda Machine (BLPM). 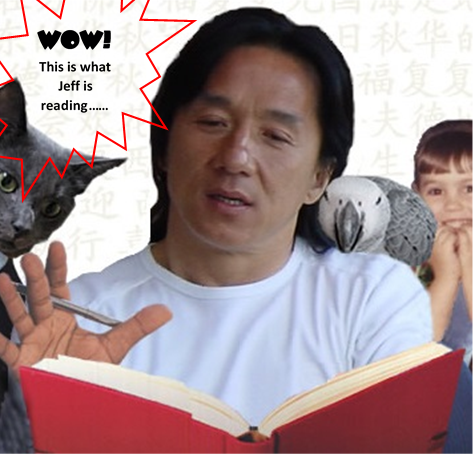 Chinese who grew up in the 90% class write mostly in obscurity. 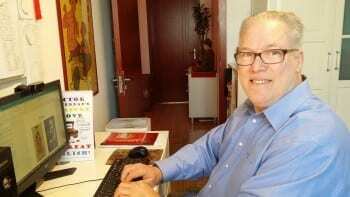 I read the books and interviewed two of them on China Rising Radio Sinoland, Dongping Han (http://chinarising.puntopress.com/2016/11/09/son-of-the-revolution-dongping-han-on-growing-up-during-chinas-great-leap-forward-and-cultural-revolution-china-rising-radio-sinoland-161110/) and Mobo Gao (http://chinarising.puntopress.com/2017/03/30/from-poor-peasant-to-phd-professor-mobo-gaos-revolutionary-upbringing-during-chinas-mao-era/). 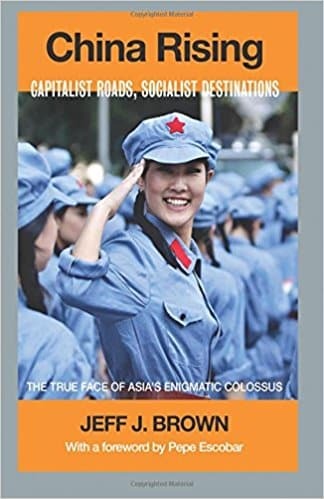 They offer a diametrically opposed interpretation of the Great Leap Forward and Cultural Revolution, compared to the China-hating Western propaganda foghorn blasting across the planet. As well, there are 84 museums and monuments across China, honoring the Cultural Revolution’s urban volunteers (https://www.weixin765.com/doc/xapekfqf.html). Interestingly, millions of urban youth got married while in the hinterlands, to poor peasants and among themselves (http://theasiadialogue.com/2016/07/13/love-in-a-time-of-cultural-revolution/). Revolution and love, like strong coffee and sweet cream. So, with sent down youth filling many important roles in China’s government, military, business and education, is it any wonder that Baba Beijing has announced a Cultural Revolution redux – in the next three years, sending 10 million volunteer urban youth to the countryside (http://www.globaltimes.cn/content/1145437.shtml)? With Donald Trump and Western empire trying to put the kibosh on the Chinese people’s relentless socialist advances, the nation’s economy is taking some hits and jobs are getting harder to find for the millions of graduates coming out of university each year. So, the benefit of the new, 21st century Cultural Revolution sent down youth campaign will serve two purposes. First, it will teach these mostly spoiled, bourgeois youngsters that if it wasn’t for Mao Zedong and the Communist Party of China (CPC), they would never have been able to be spoiled and bourgeois, in the first place, in a free and liberated China. No Mao Zedong, no CPC and China today would be a continent-sized Libya or Indonesia, balkanized into ten internecine NATO puppet states and raped by Western empire. Thus, I hope these 10 million Chinese citizens return home, as transformed as I was for the better, when I volunteered overseas, 1980-1982. New eyes and broader horizons for a new lease on life. Learning about the difficulties of provincial life outside the big cities, and then contributing to mend them, doesn’t sound unreasonable to me. Thanks, Martin. I will keep reporting on China’s 90%. Their story is very compelling. Thanks for coming, Jack! Please share CRRS widely.